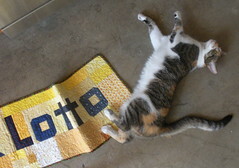 There’s a new photo of the Block Lotto banner quilt, now that it’s bound and all the quilting markings washed away. But It’s still got problems with perspective. One of these days I’ll get it right. She does add some scale, I suppose. The finished banner is 12-1/4 x 50 inches. Since I can’t seem to manage the long shot, how about a closeup showing the plaid binding and the quilting, post wash and nicely crinkled? 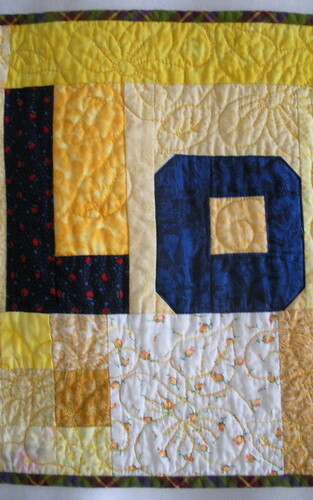 There’s an even closer at the quilting here on my blog, Sophie Junction.